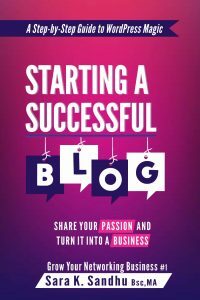 Starting a Successful Blog: Share Your Passion and Turn It into a Business is a book about how to start your blog in a Step-by-Step process. If you’re new to blogging and don’t know where to start from this easy Guide will provide you all the information needed to start a WordPress blog for your business. I live in New York and have worked at wide variety of jobs, Then in my quest to be my own boss, I started my business blog few years back. And started educating my audience about online success tools and strategies. And fox in my Facebook group were very much interested in blogging course. So I thought of creating one, but started with kindle ebook version first. And wrote this book. May be in future I'll create the course too but that I still have to decide yet. Yes, that’s right—start a successful blog to share your passion and turn it into a business, even if you donʼt have a single bone of entrepreneurship in your body! If you want to start a blog and have no clue how to start and what to blog about, then youʼre in the right place! You’re going to learn exactly what you need to start your own WordPress blog. Before I explain all the seven steps to start a blog, letʼs find out what a blog actually is and why you should blog. A blog, short for weblog, is a journal-style website consisting of articles and comments. Posts are typically displayed in reverse chronological order so the latest post appears at the top of the web page. It’s not to be confused with a website, as a blog is regularly updated. Blogging became popular after many entrepreneurs saw this as an important marketing tool. A blog can be a home business in and of itself. Letʼs make it clear why you should have a blog. As a blog is updated continuously with new content, it’s easy to keep your fans, customers, and clients up to date. Let them know about your deals and provide tips. The more prospects come to your blog, the more likely they’re going to buy from you. Blogging is a great search engine optimization (SEO) tool because search engines love new content. Blogging can increase your audience very quickly. More valuable content means more readers who become your fans and customers. Your brand can grow tremendously. Prospects can subscribe to your blog right through the pop-up or other contact forms, so a blog can grow your email list tremendously. You can make money from your blog. Along with your own products, there are many ways to monetize it through affiliate marketing, advertising, etc. For lifestyle entrepreneurs, blogging can make a great option, as it is portable and flexible. The laptop lifestyle is becoming very popular these days. So if you are looking to be an entrepreneur or home business owner, a blog can be a very convenient tool for your fast business growth. Which Blogging Platform to Use? WordPress is open source software that you can use to build beautiful websites and blogs. I recommend wordpress.org, a free nonprofit platform where you have total control of your website. You can change anything, anytime you want. It’s not to be confused with wordpress.com, a commercial platform designed to make money off your website. These two sites have totally different functions. WordPress is a very simple program to build your website with different tools, plugins, widgets, themes, etc. Started in 2003, WordPress has evolved over time. Newbies can use it right out of the box with no tech knowledge at all. Tech-savvy people can customize it in many remarkable ways. You barely have any control on your website or blog with wordpress.com just like Blogger, Weebly, Wix, etc. They want you to start with a free account, then they start charging you as you use their cart function to sell anything, but you barely have control of any other functions of your site, which is quite frustrating. You want to own your website or blog. That’s the correct way to build your business. My first website was with Weebly. The swipe function was the only good part, but it was for a fee. You had no control over the rest, which was quite amateurish for a business website.